And all of God’s poor children shouted, “They’re playing us too close”. Assimilation is the magic fleece that provides invisibility to violent minds that serves a sleepy and unsuspecting public their morning cup of coffee that’s laced with arsenic. – Theodore W.
In the News: The BBC reported Saturday that Kenyan authorities are still searching for 29 year-old UK nativeSamantha Lewthwaite. Suspected of being the mastermind behind last weekend’s terror attack at a posh shopping mall in Nairobi that left 67 people dead, Lewthwaite, also known as “The White widow” is believed to be a “captain” in the Somali militant Islamist group Al-Shabaab. Al-Shabaab has claimed responsibility for the carnage in Nairobi and a massive manhunt is currently underway for Lewthwaite and other leaders of their group. Since post 9/11 there has been nearly 20 failed attempts to kill Americans on U.S. soil in terrorist attacks. On April 15, 2013 two brothers, Dzhokhar and Tamerlan Tsarnaev, both living in the Boston, Massachusetts area, succeeded in killing 3 people and injuring an estimated 264 using two pressure cooker bombs that exploded during the Boston Marathon. American born Jihadi-terrorist John Walker Lindh is currently being held in a non-traditional prison in Indiana. Convicted of multiple crimes to kill American soldiers as an enemy combatant in Afghanistan (captured in November 2001) he openly admits that he despises America. Omar Hammami is the son of an American Christian woman and a Syrian Muslim father. Omar in his latter teenage years (while living in Alabama), embraced radical Islam and joined the notorious Al-Shabaab terror network. Al-Shabaab is the same terror group that has taken credit for last week’s terror attack in Nairobi, Kenya. Thought to be killed by the same group he pledged his life to, some speculate that Hammami is still alive and plotting more carnage. Warning: Do not be fooled, do not ignore signs of peculiar / radical behavior, for without a doubt they (the terrorists) live amongst us. At this very second living semi-inconspicuously throughout the United States and other capitalistic societies there are bitter and dangerous people who are planning to kill you and me. Don’t be lured to sleep by your big screen television set and your membership at the spa. Agents of mayhem and terror are real and they exist throughout our society. They are the product of underfunded and systematically closed mental institutions, public schools, orphanages, soup kitchens and the military industrial complex. Some agents cloak their hatred for the system (the society they live in) by pretending to be pleasant, law abiding citizens. Their middle to upper class pedigree conveniently facilitates their objective of appearingnormal as “Big Brother” who’s constantly on a mission to identify “enemies of the state”, ignores their quirky behavior and predictably zooms the camera lens on “the usual suspects”. Disillusioned by government, religion, war, and decadent opulence, they methodically spin and orchestrate a façade that’s worthy of winning an academy award for “best acting performance in a movie drama”. For the record so that you’ll know, these individuals sit across from you at work in their cubicle, they sit next to you on the subway / bus and more than likely they wait on your table at your favorite coffee shop. Their goal is to end this war mongering, materialistic, pseudo-Christian, pseudo-Muslim, politically rightwing world and replace it with nothing. They want a new beginning, a clean slate, anarchy 101. On the flip side, the other “agents of terror”, because of their misfortune of being born on “the wrong side of the railroad track” and therefore being condemned to living an existence that’s saturated by crime and unimaginable poverty, are not very concerned about concealing their anarchist attitude, so they unabashedly break bones, set fires and spit on authority. They don’t fit in society as well as their rehearsed cohorts do, however, because of the chasm between the “haves and the have nots”, they too are almost invisible to the people who live on the “right side of town” who drive through the city in their expensive SUVs and sport sedans without even acknowledging the poor’s existence. Their rage is blindly directed at a world that cares nothing about their empty belly or their teenaged sister who turns “tricks on the street” because of bad memories of a father that fondled her at ten and a mother who shows more love for heroin than her children. For them life is about pain and suffering, and they’re now ready to dispense their own dose of it to an uncaring world. Among the captured teenaged terrorists who attacked the Westgate shopping mall in Nairobi, Kenya on September 21, 2013, up to three American teenagers were among the terrorists. Kenya’s foreign minister Amina Mohamed confirmed last Monday. The Americans, aged between 18 and 19, of Somali or Arab origin, lived in Minnesota and one other place in the U.S, Mohamed said in an interview with the PBS NewsHour. One Brit was also believed to be involved. The intent of this article is not to scare anyone, rather the intent is to wake people up. The terrorist murders that occurred at the Westgate shopping mall in Nairobi, Kenya could happen in New York City, Atlanta, Georgia, London, England, Paris, France, Frankfurt, Germany, virtually anywhere. In closing, the world has evolved into a dangerous place where disillusioned teenagers now kill without thinking twice about it. Some come from poor environments and others do not. The key is to be more aware of young adults who are crying out for help. Listen to what’s on their mind and assure them their situation will improve. If you know of a child that’s struggling, help them or at least guide them towards help. Stop allowing politicians to cut programs that feed the hungry because in the end a hungry person is a dangerous person. Think about it and act responsibly before it’s too late. As always the New Orleans Examiner is interested in what you think. Why have so many young adults worldwide joined terrorist organizations? Has society completely ignored the warning signs? Inquiring minds want to know. Sound off. Until next time, Good day, God Bless and Good fishing. The students were infuriated over the seemingly endless hours of waiting due to the frequent closure of the terminal by Egyptian authorities. Hundreds of angry Palestinian students who have been stranded for days at Rafah crossing on Sunday stormed the gate of terminal from the gaza side. The students stormed their way towards the Egyptian side but the Palestinian security forces manning the terminal blocked them, eyewitnesses told Anadolu Agency. “If we do not travel this week, our university will expel us, and our residence would consequently expire,” one of the students who stormed the gate told AA. Hundreds of Palestinian students trying to travel to their universities abroad have been stranded at the crossing for days in hopes of getting through the terminal, gaza‘s only gateway to the outside world as all other points into or out of the coastal enclave remain blocked by Israel. Around 5,500 Palestinians are on wait lists to cross into Egypt but the Egyptian side only allows few Palestinians through, said Maher Abu Sabha, director of borders in the gaza government. “To write more truthfully about the Nakba is not just to practice a professional historiography; it is also a moral imperative of acknowledgement and redemption.” The Palestine Nakba: decolonising history, narrating the subaltern, reclaiming memory’ (Zed Books, 2012) dismantles the myths structured by Zionism and sustained by an acquiescing narrative, furthering recognition of Palestinian legitimacy which surpasses remembrance. Nur Masalha’s research provides a meticulous framework through which the Palestinian struggle for memory exceeds the conventional definition of resistance tainted by the enforced oblivion of Palestinian narrative. Through analysis of various academic works which are compared and contrasted to various Palestinian narratives, Masalha elevates subaltern memory to prominence, highlighting a continuous rupture exacerbated by euphemisms which attempt to diminish the Palestinian problem. The various memory conflicts expounded upon in the book stem from Israel’s insistence upon manipulating Palestinian history in an attempt to thwart Palestinian consciousness, not only within the dispersed national dimension. The international support which Zionism harbours enables the occupying power to maintain the endorsed alienation from Palestinian existence and memory, which is erroneously supported in the West through a selective discernment of what constitutes genocide, thus displacing Palestinian history while supporting Zionist ambiguity and denial of the Nakba. The collaboration both at the Zionist governmental and academic levels portrays a reinvention of Jewish historiography ‘divorced from collective memory’ as the obsession of rewriting history in order to construct the fabrications of Jewish nationhood strive to eliminate the authenticity of Palestinian memory, hence the importance of reversing the traditional approach to history by returning to the subaltern memory – a component which is particularly vital in securing the Palestinian narrative which has already suffered appropriation and destruction of archived historical material. Zionist historiography justifies Jewish independence by expounding upon oriental stereotypes, thus promoting Palestinian displacement and the elimination of the indigenous population in order to maintain the myth of the barren land. The Nakba, described by Israel as the war of liberation, is relegated to a segment of history within the Israeli narrative which is either denied or else misrepresented in a manner which seeks to divest Palestinians not only of their legitimate rights to land, but also of their existence. The settler-colonial memory supported by the Plan Dalet created colonial terminology which justified the occupation supported by imperialism. The justifications endorsed and promulgated by Israel reflect the lack of anti-colonial debate to the point of distortion concerning the actual commencement of the colonisation of Palestine which liberal Zionists claim had started in 1967. Masalha, however, traces the origins of colonisation back to 1882, when the concept of forced transfer had already formed part of Zionist ideology. Marginalising Palestinians by declaring them a segment of the Arab population furthered their displacement in terms of historical visibility enhanced by Zionist manipulation of language supporting a fictitious common history among settlers while justifying the ethnic cleansing of Palestinians through the colonising of remnants of indigenous memory. The imposition of Jewish collective memory designed by Zionism is a focal issue through which the colonisation of Palestinian identity and collective memory can be challenged through subaltern memory and the processes through which it ensured remembrance remained enshrined within a resistance which protected its people from the sequence of oblivion. The subaltern has presented a challenge to Zionist efforts to appropriate Palestinian territory. Toponymy, the destruction of Palestinian sites and their reinvention into places of allegedly Jewish significance aided by the Jewish National Fund (JNF), the demolishing of villages in an attempt to invalidate Palestinian claims, massacres, internal forced displacement and the millions of Palestinian refugees have been minimised within the Zionist narrative to strengthen the alleged connection “between the days of the biblical Israelites and the modern Israeli state”. However, the intention to construct a state upon remnants of Palestinian territory is challenged by the strength of Palestinian memory. Despite eradication of Nakba discourse from Israeli debate which intentionally fails to associate the violence unleashed upon Palestinians as pertaining to Palestinian memory, Palestinians have struggled from the periphery for their right to memory within a context which the Israeli narrative deems obsolete. Masalha highlights the urgency expressed by Palestinians in asserting their historical memory in various mediums of dissemination. With a discrepancy between Israeli and Palestinian narratives regarding documented collective memory, Palestinians have embarked upon a process of unification within various experiences of the Israeli occupation which reflects the colossal predicament of refugees. Israel’s vast archives and destruction of Palestinian documents led to unjustifiable claims of Palestinian memory as unreliable, hence the importance of asserting oral tradition to reconstruct the ostracised history, particularly the atrocities of the Nakba. Masalha states that “The overall bias towards Israeli ‘archives’ and the lack of sufficient attention given to Palestinian oral history have contributed to silencing the Palestinian past … As is the case with other subaltern groups, refugee oral testimony is a crucial source for recovering the voice of the victims of ethnic cleansing and for constructing a more comprehensible narrative of the experience of ordinary Palestinian refugees”. The urgency also reflects the necessity to rapidly depart from the colonial perspective in a manner through which Palestinians are able to author their own history, as well as counter Israeli perspectives that Palestinians should acknowledge responsibility for the Nakba. The continuity of trauma necessitates the validation of oral history within Palestinian collective memory, in order to challenge the conventional Israeli historiography supplemented at various levels including education, by Israel’s security agency, Shin Bet. Palestinian oral history is disassociated from any ideological project, however it should be allowed the space to flourish and challenge the manipulation of discourse through recollection of Palestinian trauma. Exposing Israeli patriotism as a force intent on the obliteration of the indigenous population in turn provides the initial deconstruction of oblivion processes which tend to have further ramifications than the obvious process of forgetting. Indifference plays an integral role in the dynamics of oblivion – recognition of subaltern memory significantly challenges the exclusion of the Nakba from any political platform including the alleged peace process. Masalha’s arguments for a coherent counter hegemony that dispels Zionist manipulation of language, history and memory, based upon recognition of the Nakba and efforts to maintain its protection against denial especially with the international community portray the need to comprehend and maintain a wider commitment to the Palestinian struggle against Zionist and imperialist oblivion. Last year, the US North Coast Coalition for Palestine started a campaign to exclude the multinational transport and municipal services firm Veolia from a public transit contract in Sonoma County, California. In the 13 September letter, Moldawer launches a shameless and unfounded attack on the boycott, divestment and sanctions (BDS) movement and one of its founders Omar Barghouti. This is perhaps a sign of Veolia’s sensitivity to the growing power of a movement whose aim is to hold Israel and the companies that profit from its violations of Palestinian rights to account. However, the BDS movement has a track record of carefully researching the role of companies in the Israeli occupation of Palestinian land, including when companies announce that they have withdrawn from such activities. Alerted by Moldawer’s letter to Sonoma County, activists also found the announcement of Veolia’s withdrawal from all Israeli bus lines on Veolia Israel’s website. Occupation watchdog Who Profits found confirmation of the sale in the Israeli companies’ registrar. Veolia had already terminated its operations in the Modi’in bus lines in August. The three remaining bus lines that run on occupied Palestinian land have now been sold as part of the deal with Afikim. In fact, the global BDS movement developed in response to a call issued independently by 170 Palestinian civil society organizations in 2005 — decades after the Arab League’s now largely defunct commercial boycott — to achieve an end to occupation, equal rights for Palestinians, and recognition of the Palestinian right of return, as required by international law. The call for BDS ends when these violations of Palestinian political, human and legal rights come to an end and the Palestinian people’s right to self-determination is respected. The BDS movement aims to hold Israel and other actors including governments around the world accountable for their role in Israel’s violations of international law. Moldawer’s claim that “BDS is pursuing its goal of demonizing Israel and companies that do business with Israel” is therefore misplaced, although no company should be proud to profit from occupation, colonial exploitation and apartheid. During the 1970s and 1980s, a global movement emerged to urge divestment, sanctions and boycotts of companies that were complicit in and profited from apartheid in South Africa. While some might have called that “demonizing” South Africa or the companies that profited from its racist system, this movement was, like the present BDS movement, a non-violent, morally consistent effort whose objective is to end oppression. In response to Veolia’s claim, Barghouti wrote me that he never said such a thing about the BDS movement, “not even remotely.” Barghouti says that Veolia misrepresented a phrase from a 2004 article he wrote on The Electronic Intifada about the one-state solution. This was before the BDS movement was even born. Anyone familiar with Barghouti’s many articles and public speeches — including a recent one in Oslo — knows that he has always been consistent in supporting equal rights for all in the context of a non-racist, decolonized political outcome, to which, he believes Zionism is a major obstacle. However, his attack on the BDS movement and Omar Barghouti clearly follows thehasbara – propaganda – logic of the Israeli government. It also calls for BDS efforts toward multinational corporations to be investigated. Slide from Veolia Transportation US presentation at Sonoma County hearing in July 2012 attempts to smear activists by association with The Electronic Intifada. This is moreover not the first time that Moldawer has attacked the BDS movement. In July 2012, Moldawer represented Veolia Transportation US at a hearing of the Sonoma County Commission on Human Rights that was considering Veolia’s exclusion from the transit contract. Baltzer rightfully concluded that Moldawer had used a guilty-by-association accusation which was based on a false claim. Meanwhile, despite the sale of the bus lines, Veolia continues to profit from occupation. Moldawer confirms in his letter that Veolia Transportation US’s parent company Transdev will continue to operate the Jerusalem light rail and that the company owns five percent of the project. Transdev is the result of a merger between Veolia Transportation and Transdev. The French parent companies Veolia Environnement and Caisse des Dépôts Développement each own half of the shares of Transdev. The Jerusalem light rail is a component of the “Jerusalem Transportation Master Plan” sponsored by the Israeli government and the Jerusalem occupation municipality. The light rail was designed to serve the needs of Israel’s illegal settlements on occupied Palestinian land. Veolia and the French multinational Alstom are involved in the first line of the light rail which connects western Jerusalem with illegal settlements in the occupied West Bank, around eastern Jerusalem. Israeli settlements in the occupied West Bank and Israel’s annexation of eastern Jerusalem are illegal under international law. Veolia, therefore, remains implicated in maintaining – and providing services to — Israel’s illegal settlements, occupation and annexation of Palestinian land. Veolia also remains involved in the Tovlan landfill in the occupied West Bank’s Jordan Valley where waste is dumped from Israeli recycling factories and illegal settlements. Who Profits found that the Israeli Ministry of Environmental Protection could not substantiateVeolia’s claim that it had sold the Tovlan landfill. Veolia continues to provide services to the illegal settlement of Modi’in Illit, according toVeolia Water Israel’s website. Modi’in Illit is situated between Jerusalem and Tel Aviv, in the occupied West Bank. Despite Veolia’s misrepresentations, it is clear the company is starting to feel the heat and the BDS movement will continue to hold governments and companies accountable for their role in Israel’s violations of the rights of the Palestinian people. BEIRUT (AFP) — An airstrike on a high school killed 16 people, most of them students and teachers, in a rebel-held city in northern Syria on Sunday, a monitoring group said. “The Syrian air force bombed a technical high school in the city of Raqa, killing 16 people, among them 10 students aged under 18, and wounding many others, some critically,” said the Syrian Observatory for Human Rights, updating an earlier toll. The Britain-based group posted video footage showing mangled bodies, one lying under schoolbooks. Its authenticity could not immediately be verified. “There was panic, with children crying as they sought to take shelter,” the Observatory quoted a survivor as saying. Raqa, on the Euphrates River valley 100 miles east of the main northern city of Aleppo, is the only provincial capital entirely in rebel hands. Captured from government forces on March 6, the city is now largely controlled by Al-Qaeda loyalists of the Islamic State of Iraq and the Levant. The airstrike came after rebels launched an overnight attack on army positions in Nasseriya al-Qalamun, north of Damascus, killing at least 19 soldiers and wounding 60, the Observatory said. “There were also losses in the ranks of the rebels, who succeeded in capturing several positions,” it added, without giving a figure. Meanwhile, the bodies of 14 pro-regime militiamen killed in Zamalka east of Damascus were transported to their native city of Homs, said the Observatory. The army said it killed “a large number” of rebels in Nashabiyeh, north of the capital. Violence has raged for months around Damascus, as the army has fought hard to keep the rebels out of the city. Activists say the army has for months besieged rebel-held areas, mainly east and southwest of Damascus. The Observatory, meanwhile, updated its toll to 34 for a Friday car bombing at a mosque in Rankus north of the capital. Among the casualties were four children, it said. In southern Syria, after four days of fighting that killed 26 soldiers and “a large number” of rebels, among them seven non-Syrians, the opposition took a customs building and an area linking Daraa to the Golan Heights, the Observatory said. Amman, meanwhile, protested to Damascus after a shell struck the northern Jordanian city of Ramtha three days ago. What’s next for the country that sparked the Arab uprisings? Tunisia is viewed by some as the success story of the Arab Spring, but realities on the ground may prove otherwise. On Saturday, the country’s democratically-elected Islamist-led government agreed to resign following months of political turmoil, as tensions with secular opposition parties mounted. Angered by the assassination of two opposition politicians, critics claim the governing party, Ennahda, is too soft on hardline Muslim groups, all while mishandling the economy. So, as Tunisians face further political upheaval, what lies ahead for the country that sparked the historic revolutions? Join us at 19:30GMT. An Egyptian court’s decision Monday to ban all activities in the country by the Muslim Brotherhood is the kind of foolish act that autocratic governments take when they do not know how to engage in a process of democratic pluralism and seek refuge in their mistaken sense of infallibility. The real issue at hand is not a decision by a minor court regarding the legality of the Muslim Brotherhood’s registration last March; it is rather about the ongoing attempt by the armed forces and allied political groups to eliminate the Muslim Brotherhood from the public scene in Egypt. This is foolish in every respect—in politics, culture, religion, constitutionalism—and shows the crude immaturity of the armed forces as an instrument of governance. The ongoing assault against the Muslim Brotherhood has included killings, beatings and mass arrests that have temporarily thrown the organization into disarray. Trying to eliminate it will not work, and will only send Egypt into a deeper cycle of political polarization, immobility and some violence. Egypt requires pluralism, engagement, negotiations and compromises, in order to achieve credible consensus on key issues. Banning the Brotherhood goes against all these imperatives, and will only make things worse. Egypt is passing through a period of relativities, not absolutes, regarding both the armed forces and the Brotherhood, who are both key actors in society. The vast majority of Egyptians have repeatedly asserted that they trust the armed forces to manage a short-term transitional process that ends with the installation of a legitimate, elected government, president and parliament. The citizenry also values the security forces’ role in ensuring stability and security throughout the country. But Egyptians do not want the military to rule the country. They experienced that for 60 years from 1952 to 2011. The revolution in January 2011 was their clear rejection of that kind of system that saw Egypt become a forlorn global backwater of mediocrity and mismanagement. Egyptians do not view the military in absolute, black-and-white terms. Similarly, Egyptians also do not view the Muslim Brotherhood and other Islamists in absolute terms, but rather through a much more nuanced lens of relative benefits, concerns and practical efficiencies. The Brotherhood was the leading opposition movement in the country for decades, and paid the price for its courage by having thousands of its members jailed and tortured. Its social assistance programs endeared it to millions of poor Egyptians, as did its provision of the basic succor of religious hope and faith. It was always present at the local level in neighborhoods and villages everywhere. It spoke the language of the ordinary man and woman. It was always a strong element in the basic values and the core identity of most Egyptians. It did all these things naturally and efficiently, while the old soldiers who ruled the country with an iron fist did almost none of these things. So it was no surprise that the Brotherhood won the parliamentary and presidential elections that were held in the past two years, and they were rightly given the opportunity to run the country. They totally mismanaged their incumbency and showed that their prowess as a grassroots-based national social services and political opposition movement was matched by their incompetence and buffoonery as governors with legitimate authority. Worse than this was their inclination to be bullies in power, bulldozing a really infantile and insulting constitution through a totally non-credible ratification process that only exposed their dark penchant to grab power by any means. The Brotherhood, like the military’s old men with guns before it, learned in turn that ordinary Egyptians viewed and judged it in relative, not absolute, terms. Egyptians liked the many things the Brotherhood offered them, but citizens wanted effective government services along with feel-good sermons and slogans. In over a year in power, the Brotherhood showed its total incompetence, which eroded its legitimacy. Consequently, tens of millions of Egyptians rallied against it in recent months, and ultimately removed it from office with the direct intervention of the armed forces. The Brotherhood retains its core credibility in Egyptian society, given its compelling multi-media message to so many of a blend of political hope, social justice, moral self-assertion, welfare assistance, a compassionate ear, a core identity, a values-based and homegrown humanity, and a free or affordable health clinic within walking distance of home. It now faces the enormous test of how to transform all this into an operational political machine that citizens trust to run the national government, rather than just a local soup kitchen. The Brotherhood failed its first test in office, but cannot be disqualified forever from the political arena. Egypt has tried this kind of heavy-handed, one-party military rule, and it was a catastrophe. Repeating it would only add imbecility to the attributes of the Egyptian governance system that is heroically trying to reconfigure itself in a democratic and constitutional manner. The movement said in a statement that “all of Palestine, from the Mediterranean Sea to Jordan River, belongs to the Palestinian people and our nation and no occupier has the right to claim it as his land”. Hamas called upon its counterpart in the West Bank, Fatah, to shoulder their responsibilities and to halt the negotiations and security coordination with the enemy and to return to resistance, national reconciliation and unity of the Palestinian ranks. The movement stressed that “Israel’s schemes to Judaize Jerusalem and to divide Al Aqsa Mosque to build the Temple will not succeed in obliterating the historical facts and will fail in the face of steadfastness by the Palestinian people”. It pointed out that “Jerusalem will remain an Arab and Islamic city and the capital of the Palestinian State while Al Aqsa Mosque will remain a pure symbol of Islam and a thorn in Israel’s throat”. The movement renewed its stance that resistance is a strategic choice to defeat the occupation, saying: “Resistance of all forms, especially armed resistance is the strategic choice to defeat the occupation and the best answer to its continued crimes in the West Bank and East Jerusalem whose residence face daily attacks, harassment and racism. What has been taken by force, could only be restored by force”. The movement called on residence of Jerusalem and the neighbouring areas to rally in Jerusalem and resist the occupation crimes”. Hamas also urged Arab and Islamic nations and the Palestinian masses to mobilize to defend and support Jerusalem and Al Aqsa. The Hamas statement demanded that Egypt to lifts its siege of the Gaza Strip, stressing that the unjust blockade and continued incitement against the resistance only serves Israel’s interest. Yesterday, 28 September, marked the 13th anniversary of the Aqsa Intifada which erupted in 2000 when former Israeli Prime Minister Ariel Sharon stormed into Al-Aqsa Mosque courtyards guarded by hundreds of policemen and soldiers. WASHINGTON (AFP) — Iran’s Foreign Minister accused Israeli Prime Minister Benjamin Netanyahu of peddling lies Sunday over Tehran’s nuclear activities, and defended his country’s “non-negotiable” right to enrich uranium. Mohammad Jawad Zarif told US television that Netanyahu — en route to the United States for talks and a speech at the United Nations — was wrong to allege that Iran’s recent moves to cooperate with the West amount to little more than an insincere charm offensive. Netanyahu has dismissed new Iranian President Hassan Rouhani’s drive to mend fences with the international community. Such steps led to the latter’s 15-minute telephone call with President Barack Obama last week. Netanyahu has accused Rouhani of being a “wolf in sheep’s clothing,” whose talk of allaying western concerns is a confidence trick and on Sunday he called on his US ally not to be fooled. “I intend to tell the truth in the face of the sweet talk and charm offensive of Iran,” Israeli public radio quoted Netanyahu as saying before he boarded a plane for Washington. “A smile attack is much better than a lie attack,” Zarif said in an interview with ABC Television’s “This Week” political talk show. “Mr Netanyahu and his colleagues have been saying since 1991, and you can check your records, that Iran is six months away from a nuclear weapon. “We’re 22 years after that and they are still saying we’re six months away from a nuclear weapon,” he added. But sanctions imposed by western governments in recent years are the major hurdle in the way of a deal being reached, he maintained. “Sanctions are not a useful tool of implementing policy. And the United States needs to change that,” Zarif said. “Negotiations are on the table to discuss various aspects of Iran’s enrichment program. Our right to enrich is non-negotiable,” he added. 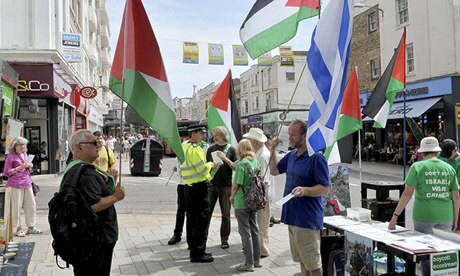 Pro-Palestine and pro-Israel supporters protest outside the EcoSource shop in Brighton. When SodaStream was looking for somewhere to open the UK’s firstEcoStream store, dispensing ethically sourced food, drink and cleaning products into customers’ own bottles and jars, Brighton must have seemed the obvious place. The city is famous, after all, for ethical consumption of all kinds, and elected Britain’s first and only Green MP. What they may not have considered, however, is that Brighton is also the kind of place where people know that SodaStream’s headquarters are inIsrael, and that their factory at Mishor Adumim is built on illegally occupied West Bank land. As a result, every Saturday afternoon for more than a year now, the shoppers on Western Road have been able to witness an ethical-consuming protest against an ethical-consuming shop – and latterly a protest against that protest too, from pro-Israel activists including Julie Burchill and Chelsea Fox, a drag artist who likes to dress up as Grace Jones. Except I get the feeling that on Saturdays most people are doing exactly that – passing, and not going in. Inside the shop there are tanks full of extra virgin olive oil and raspberry vinegar, an array of Ecover products, a whole wall of smart new SodaStreams … and no civilian customers at all. There’s also a security guard on the door. At least he’s making money. For their part, SodaStream won’t budge. “We do not seek confrontation but we will not close the shop in Brighton,” chief executive Daniel Birnbaum told the Brighton Argus. Birnbaum cites the 442 Palestinians and 237 Israeli Arabs that the company employs at Mishor Adumim, with healthcare and salaries triple the national average.